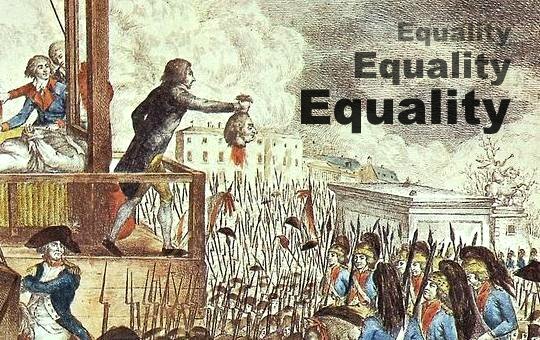 There is a big difference between true equality and egalitarianism. While true equality among men is good and comes from our shared human nature, egalitarianism is a liberal worldview that paints all legitimate inequalities as evil and strives to eliminate them. The Left is addicted to this false religion of leveling, because it really doesn't care about true equality -- it only cares about egalitarianism, which it calls "equality." Under the banner of equality, for example, the French Revolution justified regicide, acts of terror, and the persecution of the Church. French Revolutionary leader Robespierre said: "It is not enough to have overturned a throne; our concern is to erect upon its remains holy Equality..."
Under the same banner of equality, communist and socialist regimes tortured and snuffed out millions upon millions of lives. And right now, under the very same banner, the homosexual revolution is tearing down moral values and attacking the definition of natural marriage. Deep down this attempt to do away with all natural differences is a direct attack against God and His plan for creation. St. Thomas Aquinas teaches that inequality is good because God wants the universe to reflect all His perfections. (Suma contra Gentiles, Book II, Chapter 45) Since individual creatures only reflect a small aspect of their Creator, God made a world with an enormous variety of different creatures to better express His infinite perfection. Take a look at the mineral kingdom and its complex hierarchy. We find common stones used to build beautiful cathedrals and we have those rare and precious stones that dazzle and sparkle. The Hope Diamond is clearly not a piece of ordinary sandstone. So, from a grain of sand to a sapphire, each mineral has its own place, role, and function. The plant kingdom also has immense variety. Each tree, shrub, and vegetable has its place and purpose that reflects a sliver of God’s perfection. The simplicity of a dandelion will never match the elegance of a rose, which is the queen of flowers. Then there's the mighty sequoia that outclasses other trees with its massive majesty. Isn't this variety wonderful? The animal kingdom is also a staircase of unequal creatures. The bald eagle, for example, reflects America’s highest virtues much more than a clumsy turkey or a toad. The African lion is the king of beasts and the ugly hyena instinctively knows it. The charm of the house cat is entertaining, but it doesn't match the fidelity of a guard dog. So as you can see, each animal has its place in the order of Creation. The same principle of inequality applies to mankind. As children of Adam and Eve, we all share the same human nature and inherit the same basic rights that flow from that nature, such as the right to life, the right to start a family, the right to private property, and the right to practice the true Faith. -- And the Blessed Virgin Mary is the prototype of all mothers. As you can see, the human condition varies greatly. That is why American author, James Fenimore Cooper once said that: "Equality of condition is incompatible with civilization, and is found only to exist in those communities that are but slightly removed from the savage state. In practice, it can only mean a common misery." True equality sees all men as children of God with the same basic rights and dignity, while recognizing, fostering and celebrating the inequalities God put in each individual. Mankind is like a symphony orchestra: each instrument plays its part. Some instruments are prominent, others less, but the harmony of the orchestra comes from the ensemble, working together under the wand of a conductor. You can't play a concert with just one instrument, or on just one note. It's doesn't work. In a well-ordered society everyone plays his or her instrument well. The violin doesn't envy the trumpet, nor does the flute attack the oboe. Harmony reigns. But when individual members of society are consumed with envy and hatred of their neighbor’s role and position, harmony crumbles. This class hatred is the essence of Marxism and socialism. But inequality doesn't exist for the benefit of those on top, but rather for the whole. The authority of parents over their children is for the benefit of the children and the entire family. The authority of the professor is a benefit to students and universities. And the authority of the police officer is for the safety and benefit of the common good. Therefore, every harmonic and proportional inequality in Creation is like the rung of a ladder that lifts us up and helps us reach God. That is why the liberal Left hates it so much. And that's why the egalitarian revolt -- at its very core -- is an act of hatred against God.